I've had this dessert on the waiting list for a while, since it's taken me AGES to find rhubarb as it's not in season yet. But I happened to swing by a Harris Farm Market recently and huzzah I have rhubarb! 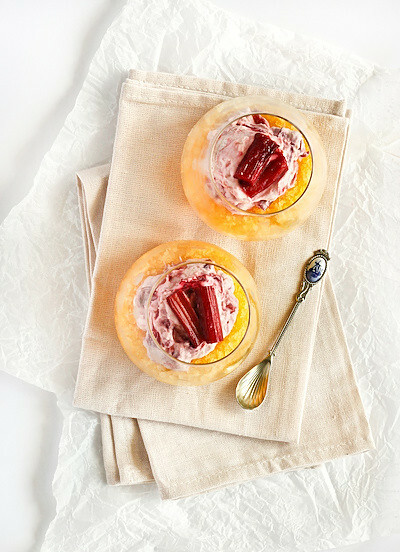 I LOVE the combination of rhubarb with citrus, especially orange or mandarin. It's a combination I've used previously (Mandarin & Rhubarb macarons, YUM) and it's delightful. 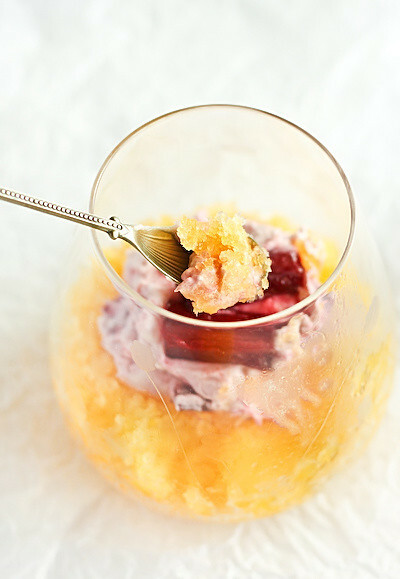 In case you can't already tell, the granita/fool combination here is inspired by one of my favourite desserts from one of my favourites restaurants, the Snow Egg dessert from Quay. I can still remember how in awe I was of that dessert, and how I didn't share a single morsel of it with A. 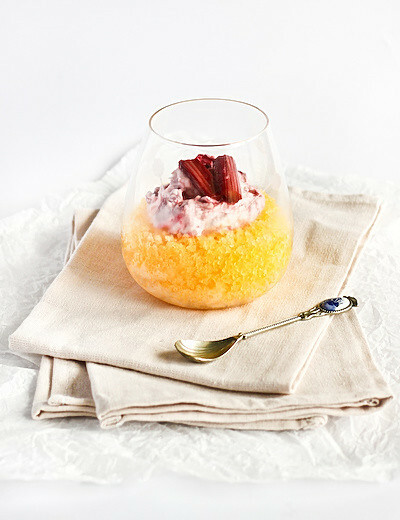 Obviously my dessert here lacks the beautiful complexity of the Quay dish, but it has some of the basic elements that I loved, the contrast of the crunchy cold granita, tangy from the orange flavouring and the smooth creaminess of the fool with soft, sweetly stewed rhubarb. Love the colours in it too. With all the cold, wet weather we've had in Sydney recently I know you might be expecting puddings and cakes for dessert, but this is such a great way to end a meal in a light, refreshing way. I generally feel like these type of fruity, cool desserts after having the heavy rich meals I tend to crave in the cooler months. It also seems quite appropriate to do a dish inspired by a restaurant which is now IMPOSSIBLE to get into thanks to the last season of Masterchef, when we are hours away from the premiere of the new season of Masterchef! I know the food blogging community in particular is waiting with bated breath because of a certain contestant who we all know well. I can't wait! I'll be hanging out on Chocolate Suze's Masterchef chat, so come join in and save everyone else from MC flooded twitter feeds! Juice oranges and strain any pulp. Place sugar and water in a small saucepan on low heat and stir to dissolve sugar and make a simple syrup. Remove from heat and add sugar syrup 1 tsp at a time to taste. (My oranges were very sweet so I hardly needed any). Add liqueur to taste and then play in the widest freezer safe dish you can fit in your freezer, I used a casserole dish. Ensure your liquid is no higher than 1 inch deep, the shallower the better as the liquid will freeze quicker. Freeze for an hour then remove and use a fork to scrape the semi-frozen liquid into fine granules. Return to the freezer and re-scrape every hour or so until the mixture is completely frozen. Keep in a freezer-safe container until ready to serve. 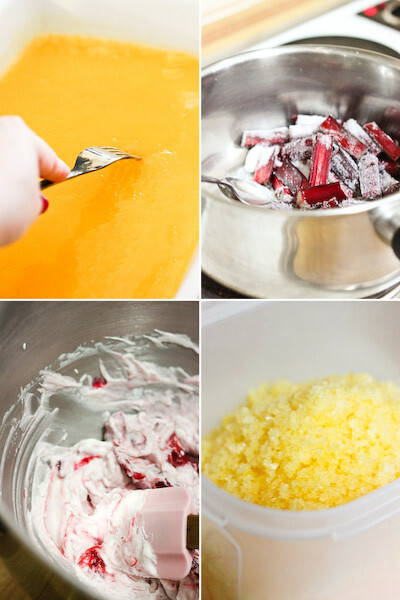 Place chopped rhubarb, sugar and water in a medium saucepan on low heat. Stir until the sugar dissolves and the rhubarb is tender, about 10 minutes. Remove from the heat and set aside to cool. 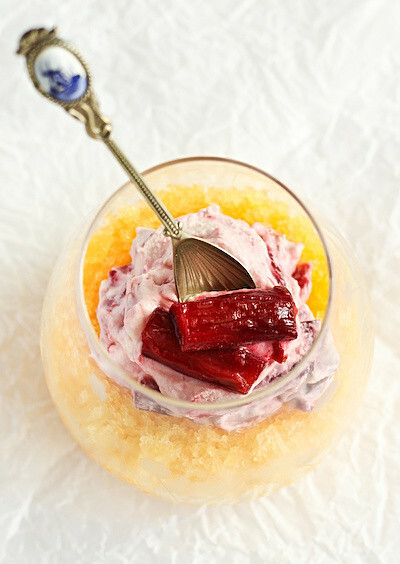 Place cream and liqueur in a large mixing bowl and whip to soft peaks using an electric mixer. Fold in stewed rhubarb, but save a few pieces to the side if you would like to use then for garnish. Chill fool in fridge until ready to serve. 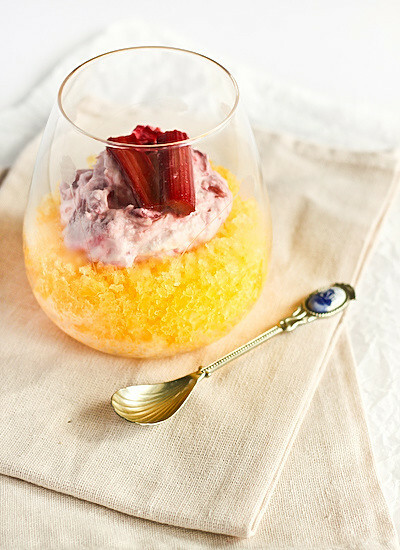 Spoon granita into serving bowls, then top with rhubarb fool and the extra pieces of rhubarb. Serve immediately. 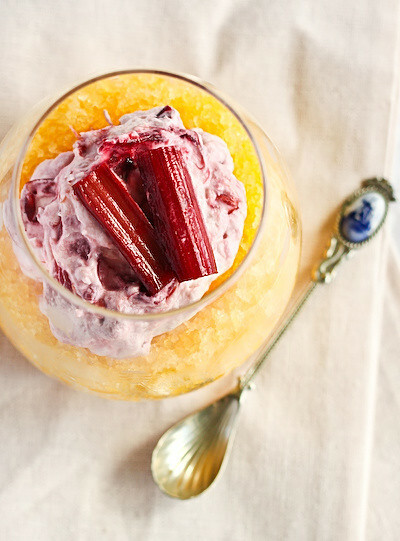 Best eaten on the same day, but the granita can be made well in advance. I like a bit of acidity in my desserts and this combination sounds lovely! this looks amazing, bumma you broke the glass. i would love to try this. wooah your orange granita is just so vivid! it's the colour of sunshine! This looks gorgeous! I love rhubarb so much. Can't wait to play with it again in desserts this winter. Hello :D I've been going back and reading through and your blog posts but I actually wanted to comment and say how much I enjoy reading your blog. The food you make is absolutely smile-inducing, and I'm feeling inspired to step out of my comfort zone and try some different recipes. I'm at college now, so I don't have access to a kitchen of ingredients, but I can't wait to be home and start baking! Dessert is my favorite meal, so I plan to start there~ I've bookmarked a few of your recipes, and I'm dying to try them out on my family. Thanks for sharing all your exciting food exploits on this blog! I still haven't recovered from your massive Tim Tam cake yet so this one really balance it out. Though you didn't do anything ballish which requires a blowtorch, the colors are beautiful and appetizing. 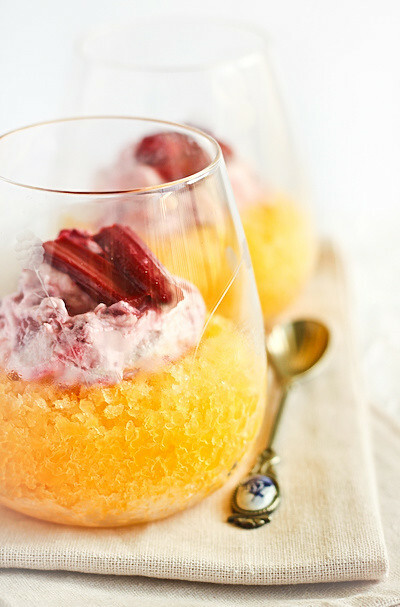 Oh I am so in love with anything orange that I just wanna bathe in that granita! omg that looks soooooooo pretty and delicious! was this the glass that you said it cracked? It looks extremely refreshing!!! Perfect for the days in my town! sugarpuffi - thanks! Yes :( :( :( They're not cracked in the photos but I cracked one last night. So sad. This is a delightful combination of flavors and so pretty too! sounds tasty , and great combination with granita! The combination of those two flavours is great. Tangy and sweet. Icy and creamy. It's an inspired dish and you are an inspiration. :) great work! WOW the colours are so pretty! i love rhubarb!